Last August I lost my VISA debit card. So I ordered a new one. When I was abroad a friend of mine’s VISA card stopped working. Why? Because back in Europe his bank decided to send him a new VISA card. Now that’s very inconvenient. That card had to be somehow securely couriered to India (I think) fast. Quickly as he had no money otherwise! 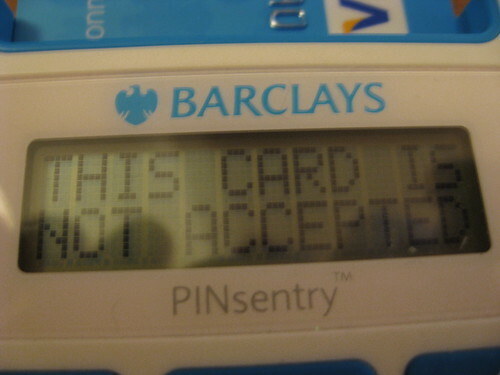 So I rang up Barclays yesterday to find out why, and they said they sent me a new VISA debit card because their new PIN sentry requires it. WTF? The cards look identical! So cards made last August, even though they announced this “new secure” initiative back in at least April, aren’t valid? WTF? !! Barclays helpdesk also informed my old VISA will stop working in four days. I wonder if a pre-order I made with the “old” card is going to fail? I think this PIN sentry roll out is going very badly. I still don’t know how this thing is supposed to work. Why don’t they demo (and TEST) it in their branches first?? Do I physically carry this device with me when I am abroad to do Internet banking for example ? !